There is no evidence that Constantine, the first Christian emperor, ever attended a church service and no indication that this brutal ruler saw Christianity as anything more than a tool to unify his empire and let him exercise more social control. However, his conversion established state patronage for Chrisitanity which remained unquestioned in Europe for almost 2000 years. The Church taught that humans were owned by God and had only duties to their Creator, not rights. This kept people humble: the idea that they had rights didn't yet exist. 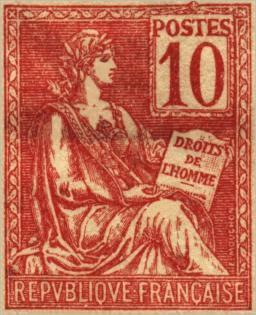 This finally changed in 1789 when the French Revolution proclaimed the Rights of Man. It was clear that people could only enjoy their full rights if the Church no longer controlled society. A clause in the French Constitution of 1795 (Year III of the Revolution) introduced separation of church and state. With this, religious organisations lost their privileges as organs of state and became private groups. However, the French were not the first. More than a century earlier this idea had been put into practice in the American backwoods. In the 1630's Roger Williams had erected a "wall of separation" between church and state in the Colony of Rhode Island. But his idea remained incomplete. Although its advantages in terms of human happiness were clear, the principle of church-state separation only took hold in the United States of America when it was underpinned by the French idea of the Rights of Man. This inspired the First Amendment to the US Constitution, which ensures the separation of church and state. When the new pope made clumsy moves to re-assert his authority over France, "the eldest daughter of the Church", the French National Assembly replied by cancelling the concordat and returning to the Revolution's separation of church and state. Franklin's invention of lightning rods was interpreted in France as a symbolic blow against absolute monarchy and his proverbs for American farmers were greeted as moral instruction for the French masses – by revolutionaries, some clerics and, later, Napoleon.